I write in support of Mr. Jose Juan Federico Moreno Anguiano (A 077-796-557). He has lived in the U.S. for over 15 years, he has five U.S. citizen children, ages 2 to 14, three of whom have respiratory problems and one who has a mental health problems. This April 15th, 2016 he was supposed to show up at Chicago’s O’Hare airport to self-deport to Mexico, away from his family and community. As you may be aware, because his deportation would cause enormous suffering for his family, he has sought ‘sanctuary’ from deportation in a Chicago church. I am aware that in the past this office has denied Mr. Moreno his request for a stay of removal. As a member of the public, I am writing in support of the review of the request from Mr. Moreno Aguiano’s legal council for a stay of removal and positive exercise of prosecutorial discretion. I understand that Mr. Moreno Aguiano was first placed in deportation proceedings in 2009 following a conviction for Driving Under the Influence (DUI). He paid all his fines, attended rehabilitation and driving safety classes, and has not made the same mistake again. This charge does not make him a risk to public safety. Mr. Moreno Aguiano is a loving father with deep relationships in his community. He is a member of the Southwest Suburban Immigration Project and has started his own delivery company to work with local businesses. The constant threat of deportation has greatly affected his daughter’s and wife’s mental health and is taking a toll on three other of his children who already suffer from asthma. I fully support Mr. Moreno Aguiano’s request for prosecutorial discretion, and urge the Chicago ICE Field Office to review its decision and grant him a stay of removal to stop his deportation. I am writing concerned about the case of Mr. Jose Juan Federico Moreno Anguiano (A 077-796-557). He has lived in the U.S. for over 15 years, he has five U.S. citizen children, ages 2 to 14, three of whom have respiratory problems and one who has a mental health problems. This April 15th, 2016 he was supposed to show up at Chicago’s O’Hare airport to self-deport to Mexico, away from his family and community. As you may be aware, because his deportation would cause enormous suffering for his family, he has sought ‘sanctuary’ from deportation in a Chicago church. I am aware that in the past the Chicago Ice office has denied Mr. Moreno his request for a stay of removal. As a member of the public, I am writing in support of the review of the request from Mr. Moreno Aguiano’s legal council for a stay of removal and positive exercise of prosecutorial discretion. I fully support Mr. Moreno Aguiano’s request for prosecutorial discretion, and urge the Chicago ICE Field Office to grant him a stay of removal to stop his deportation. 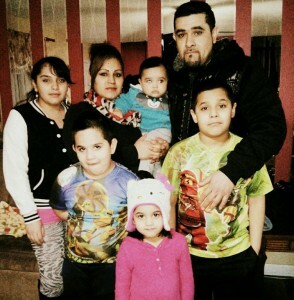 Jose Juan Federico Moreno is a father of 5 U.S. citizen children who had been given until Friday April 15, 2016 to leave the country and ‘self-deport.’ After seven years of fighting his deportation, the Chicago ICE office denied the request to postpone the separation from his family, leaving him no option but to take sanctuary in a south side church. Jose Juan is the sole breadwinner of his family. His children are between the ages of 2 and 14 years old. Three of them have asthma, and one has a developmental disability. Jose Juan and his family started a small business in Bolingbrook, Illinois, where they live. They are also members of the Southwest Suburban Immigrant Project (SSIP), where they participate in community advocacy and civic engagement activities. Jose Juan came to the attention of ICE in 2009 after he got pulled over while he was driving home from work and was charged with a DUI. No one was hurt, it was his first time, and no property was damaged, but because there were no driver’s licenses in Illinois for undocumented immigrants at the time, the police charged him with an “aggravated” DUI. Although he has complied with all of the fees, gone to the classes, has not driven under the influence since then, and regrets his mistake, ICE is using the “aggravated” charge to insinuate that the incident was much more serious than what actually took place, and to justify his deportation. During his deportation proceedings, a judge recognized that Juan Jose’s deportation would cause hardship and undue suffering for his children, but he ultimately upheld his deportation order because although he has lived here for 16 years, Jose Juan and his family could only find paperwork to prove he’s been in the US for the last nine. Before Jose Juan took sanctuary, the Chicago ICE Field office had denied his petitions for a delay in his deportation despite the extreme hardships that his family would face. Please sign the petition to show your support for Jose Juan and urge the Chicago ICE office to change their decision, and for ICE Headquarters to intervene so that this family is not separated.